It is widely recognized that trees contribute to a range of ecosystem services in urban environments. However, the magnitude of their contribution is closely related to their physiological condition and capacity to persist within our towns and cities. Root loss during transplanting, limited soil volume, impermeable surfaces, disruption to soil and hydrological processes all result in water deficits being a major physiological stress factor limiting the performance of urban trees. Reliable guidance of how and why different species and genotypes will grow and perform well in dry urban sites is of highest importance – especially for long term resilience and for avoiding planting less suitable trees in sites where they don’t have the capacity to develop well. By measuring the leaf water potential at turgor loss (ΨP0) it is possible to provide a robust measure of drought tolerance. A more negative ΨP0 allows the leaf to maintain physiological function over a wide range of time and dry conditions. This has further implications on e.g. soil matric potentials (Ψsoil). The data presented give important insight into the potential of different trees’ tolerance to periods of low water availability and provides quantitative data not previously available. The technique shows great promise as a screening tool for the drought tolerance of both new and traditional plant material, and will be highly relevant for those selecting trees for urban sites as well as for nurseries seeking to evaluate genotypes for production purposes. The presentation will focus on recent research from Sweden, UK and USA where studies have made it possible ranking species/genotypes depending on their drought tolerance, including many rare and untraditionally species and genotypes of trees – many considered as trees for future urban environments. Dr. Henrik Sjoman, Lecturer and Researcher at The Swedish University of Agricultural Science & Scientific Curator at Gothenburg Botanic Garden. Henrik’s research focuses on understanding trees’ capacity of growing under different climate conditions and site situations. By understanding the mechanisms that trees have developed in their natural habitats it is possible to pinpoint their use potential for different urban sites and also for different ecosystem services. Due to the importance of moving from traditionally used tree species to more untraditional trees, much of Henrik´s research include rare species and genotypes that will help make up a resilient urban treescape. Lesson learned: Applying i-Tree for Research, Management and Education in Different Parts of the World. Ever since the release of the Urban Forest Effects and STRATUM models in the United States over 15 years ago, interest has steadily grown in models and technological applications for use as management and research tools for urban forestry. Currently, with the release of the i-Tree software suite, interest and use has also grown outside the US and Canada by the urban forestry and arboriculture fields. This presentation will use case studies and experiences from different cities and communities in the United States, Chile, Mexico, Italy and China that used components of i-Tree for not only research, extension, and university undergraduate education; but for designing management and planning objectives, formulating policies, community involvement and advocacy as well. Particular focus will be given to the advantages and disadvantages of using i-Tree models and tools outside the United States for different purposes. Findings from i-Tree model evaluation and uncertainty studies will be presented as will examples of their use for academic and continuing education. Experiences in using i-Tree for community involvement and municipal tree management objectives and policy formulation will be shared. Recommendations – as well as success and failures- based on these case studies for the use of i-Tree and research findings for urban forest governance and advocacy will also be presented. Francisco Escobedo is Professor at the Universidad del Rosario in Bogotá, Colombia. Prior to this he was a Professor and Extension Specialist at the University of Florida (US) and Research Forester with the USDA Forest Service. He has 20 years of research, extension, and teaching experiences with i-Tree, forestry, and ecosystem service assessments throughout North and South America as well as Italy and China. Research and professional experience in urban and peri-urban forestry include: organizing i-Tree workshops, undergraduate-graduate university education, forest management-planning as well as research in policy analysis, ecosystem services modelling, socioeconomic valuation, geospatial analysis, and forest inventory-monitoring. The economic, environmental, and social benefits of urban trees have been widely quantified and documented. However, the costs of urban trees (environmental or otherwise) are much less understood. For this research project, we surveyed urban forestry programs in the Chicago Metro Area to determine the material/energy inputs and waste outflows associated with growing, planting, maintaining, and removing a typical urban tree. Our goal was to determine, from a carbon footprint perspective, the point in which the benefits associated with an urban tree outweigh its economic costs (i.e., at what age does a tree pay off its environmental debt). This was then compared to the average lifespan of trees in the surveyed cities. Results highlight arboricultural practices which are currently the main contributors to global warming potential and show the importance of maximizing the functional longevity of urban trees. The positive links between contact with nature and health have received increasing attention over the past decade, particularly in urban environments. Settings that support good health and quality of life are a fundamental component of sustainable cities. Even while the importance of green environments within urban settings is gaining acceptance, professionals working in urban planning and design face substantial challenges in achieving desired ecological, social, economic and political outcomes. While the desire to create green cities is well documented in urban planning strategies, planning legislation, practices and processes often constrain retention of natural systems and incorporation of green infrastructure. For centuries, our cities have been engineered to protect city inhabitants from the vagaries of nature and exclude natural systems. What needs to be done to initiate change within community attitudes and promote a new paradigm of city planning and design that values urban nature and supports biodiversity conservation and retention of tree canopy? This presentation will present two case studies to explore current challenges relating to greening our cities. The first considers personal observations of local community responses to initiatives promoting planting more trees and establishing an “urban forest”. The spectrum of responses illustrates why it is important to understand how language, imagery and perceptions currently influence community mind-sets. The second provides selected outcomes of a workshop held in Perth, Australia that explored the impacts of reductions in urban tree canopy, heat and public health. Workshop discussions offered much insight into differing perspectives and perceived importance of urban tree canopy, barriers to retention and establishment, and what was required to protect and promote the value of urban trees. For 20 years, Dr May Carter worked as a researcher and consultant with a particular interest in relationships between people, urban green space and health. May published numerous journal articles and book chapters and presented at national and international conferences on topics relating to planning, design and management of urban green spaces; nature-based play, recreation and tourism; community engagement and environmental education. May now holds a senior policy position and spends much of her time determining how best to balance conservation outcomes and recreation needs in urban and regional parklands. The International Society of Arboriculture (ISA) is a world’s largest arboricultural organization with over 24,000 members and over 30,000 credential holders. 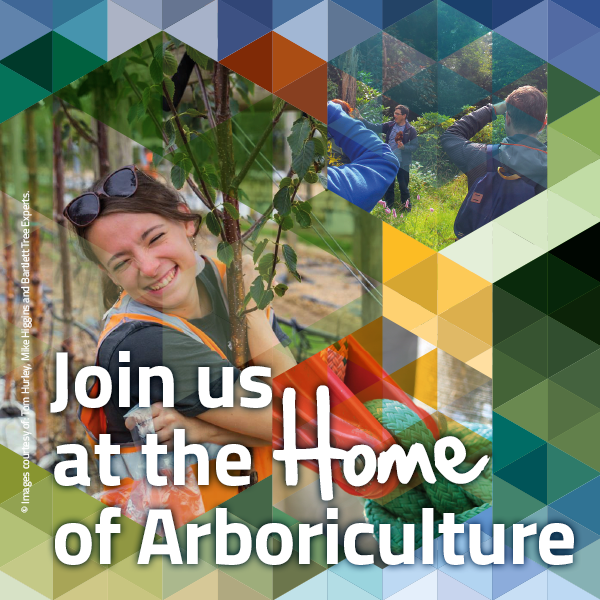 The Arboricultural Association is a partnering organization of the ISA, sharing a common mission and goals of educating the public and decision makers about the critical contributions that trees make to the quality of life in our communities. This brief presentation will provide an update of ISA activities and programs dealing with research, education, and practice that can make the world a better place, one tree at a time. Paul D. Ries is the Director of the Graduate Certificate in Urban Forestry Program at Oregon State University in Corvallis, OR, USA, where he teaches online courses in arboriculture, urban forestry, and green infrastructure. He also directs a program that provides technical urban forestry assistance to cities, community groups, and non-profit organizations. He holds BS and MS degrees in Natural Resources and is nearing completion of a Doctorate in Educational Leadership. He has been a Certified Arborist since 1988 and serves as President-Elect of the International Society of Arboriculture. The incursion of ash dieback (Hymenoscyphus fraxineus) has clearly demonstrated the public’s concern about non-native plant pests and pathogens and an appetite to understand more about these problems. The UK Plant Health Service carries out statutory work to prevent their introduction by inspection of plants and plant products at the point of entry and monitoring for their presence within the UK. This involves checking of documentation, physical examination and laboratory testing, and working closely with stakeholders to raise awareness about harmful pests and pathogens. This has been supported by new initiatives such as the ‘Tree Health and Plant Biosecurity Expert Task Force‘ and Defra’s ‘Protecting Plant Health – A plant biosecurity strategy for GB’ to further strengthen biosecurity and reduce the rate of spread of pests and pathogens. This paper will discuss a number of ongoing and new initiatives developed by the UK Plant Health Service to encourage engagement from stakeholders, industry and members of the public with the latter concept sometimes referred to as ‘citizen science’. A recent example of such initiatives include the OPAL (Open Air Laboratories) Tree Health Survey which is the seventh national OPAL survey, launched in May 2013, with the aim to help people to learn more about trees, how to assess their general health and how to monitor for tree pests and diseases and report potential findings of the six ‘most unwanted’. The paper will further illustrate the role of projects such as Observatree and International Plant Sentinel Network (IPSN) in tree health early warning systems. Charles Lane trained as a mycologist and led the mycology diagnostic team at Fera, in this time he was responsible the first identification of Phytophthora ramorum in the UK in 2002. He is now leading Fera’s work on tree health early warning systems working in partnership with the Open Air Laboratories (OPAL) tree health survey, Forestry Commission, Forest Research, Woodland Trust and National Trust as part of the EU Life plus Observatree project as well as leading the EU funded International Plant Sentinel Network with Botanic Gardens Conservation International. He is also responsible for leading Defra’s work on ‘Inspiring the next generation of plant health scientists’ in response to the Government Office of Science’s Animal and Plant Health capability review. Many new diseases threaten trees in Britain today. The risks to our tree populations are documented, and as with Chalara dieback of ash (Hymenoscyphus fraxineus) the potential biological, ecological, economic, landscape and social impacts may be profound. Therefore, governmental support is required to invest in studying the science of tree diseases, pathogen life cycles, host response and epidemiology, so that the tree sector can engage positively and public awareness can be drafted in as a front line of defence. Biosecurity risk management, which largely focuses on controlling the pathways of pathogen introduction, should aim to control those pathways most likely to carry high-risk pathogens that will have a large impact upon important populations of UK trees. We consider the case of canker stain of plane (CSP) (Ceratocystis platani), a lethal EU Directive 2000/29/EC Quarantine parasite pathogen that, while present in Europe since the 1940s with a strong Mediterranean foothold, today presents an emerging risk to the UK’s plane trees. The extent of the risk is such that the London Tree Officers’ Association has issued a biosecurity position statement drawing attention to the risk of infection, decline and mortality to the capital’s London plane tree population. A good understanding of science, pathogen epidemiology and identification, asymptomatic colonisation and false symptomatology are fundamental if we are to develop early warning systems for alien tree diseases such as CSP that pose a real and present danger of establishment in the UK. Developing cost-effective, high-level training is fundamental to generating this understanding, including acquiring basic skills in pathogen identification, early warning alerts and control systems. An innovative partnership model, based on a philosophy of collaborative scientific enterprise, is presented by Treework Environmental Practice and De Rebus Plantarum, an enterprise spinoff of the University of Padova (Padua). Focused on the example of CSP, it aims to build experience and confidence levels in the tree sector through short, high-impact university-supported workshops for practitioners, consultants and tree managers to develop their ability to identify disease expression and knowledge of false symptoms. This short, sharply-focused specialist training can deliver a sufficient level of competence in practical disease identification to build a defence against early breeches in biosecurity. Neville Fay is principal consultant at Treework Environmental Practice. He works within a multidisciplinary team on tree safety, conservation arboriculture and urban renewal, and is currently engaged in collaborative soil and tree health study projects. His ‘Innovations in Arboriculture seminar series’ delivers international knowledge to the tree and allied sectors. Neville is an expert witness and lectures in the UK and abroad and publishes on conservation arboriculture. He is founder of Tree Aid and past chair of the Ancient Tree Forum. In 2009 he was awarded the Arboricultural Association Award for Continued Services to Arboriculture. Lucio Montecchio is Professor of Forest pathology and Amenity trees pathology at the University of Padova, Italy. His research has focused mainly on the ecology, epidemiology, survey and low-impact control measures of pathogens. Also through “De Rebus Plantarum”, an interdisciplinary spinoff of the University of Padova, the current emphasis is on integrated management of emerging pests and diseases. He is core member for Pest Risk Analysis at the European and Mediterranean Plant Protection Organization (EPPO), and member of the panel on Forest Quarantine at IPPC/FAO. Observatree is a LIFE+ project with the objective of developing a tree health early warning system in the UK using citizen science. It is a coordinated project lead by Forest Research, with the Woodland Trust, National Trust, Fera and the Forest Commission as collaborative Partners. The project is supported by Defra, the Animal and Plant Health Agency and Natural Resources Wales. The project focuses on 21 priority pests and diseases, of which some are already established in the UK, some are recent arrivals and others are not yet present. Observatree differs from many other citizen science projects by working with a group of over 200 volunteers with a good knowledge of trees and training them further via project staff to recognise the pests and diseases and understand survey techniques and biosecurity. The volunteers have been carefully selected to provide a wide geographic spread from across the UK, thereby increasing surveillance on our woodlands with the aim of detecting the unwanted pests and diseases. Observatree volunteers also help by reporting the absence of those pests and diseases or undertaking intensive surveys in targeted areas. Furthermore, volunteers help with the verification of the pest and disease reports submitted by the wider public through TreeAlert to the Tree Health Diagnostic and Advisory Service (THDAS) ensuring that all the information needed for an initial assessment is ready for the scientists. As the project is into its third year, the results to date will be presented. The highlights, lessons learnt, and future plans will be discussed. Ana Perez-Sierra joined Forest Research in 2013 and she is the Head of the Tree Health Diagnostic and Advisory Service. She has more than 20 years of experience in plant pathology (agriculture, horticulture and forestry). From 1995 to 2003, she worked as a plant pathologist at the Royal Horticultural Society, Wisley Gardens. From 2004 to 2013, she was the coordinator of the Spanish Reference Laboratory for the Identification of Plant Pathogenic Fungi. She is now actively involved in Observatree project developing an early warning system for the detection of tree pests and diseases at a UK-wide scale. Ash dieback caused by the fungus Hymenoscyphus fraxineus (Chalara fraxinea) was first found in Poland in 1992 and has been in Britain since at least 2012. It is already killing large numbers of trees, particularly in the south and east. However, some trees appear resistant to the disease, so what proportion of our trees are likely to survive? If we can identify them ahead of time, is it practical to use these to replant areas? Waiting in the wings is the Emerald Ash Borer (EAB). This beetle was introduced into N. America in 2002 and has since killed tens of millions of ash trees. In Europe the beetle has been confirmed in Russia and is spreading towards us. What would happen to our ash trees if the EAB got into Britain, and can we prevent it? How many more ash trees would it likely kill? Ash is the second most common tree in Britain (after oak) and its loss would be even more devastating to the landscape than the effects of Dutch elm disease. Fortunately, there are management options that can slow the spread and help protect our ash trees from ash dieback and the EAB. Peter Thomas is Reader in Plant Ecology at Keele University and Fellow of Harvard Forest, Harvard University, USA. As well as his research on the ecology of trees, he also writes extensively about trees. This has included a number of books such as Trees; Their Natural History and The Ecology of Woodlands and Forests. He is currently working on another book, Applied Tree Biology, with Andy Hirons, Myerscough College, aimed at managers and practitioners. Peter has also written a number of monographs summarizing current knowledge about different tree species, most recently on ash (Journal of Ecology, 2016) including ash dieback.